Vintage 1965 photo of Ferrari 275P2 S/N 0828, 1000 KM Nurburgring. 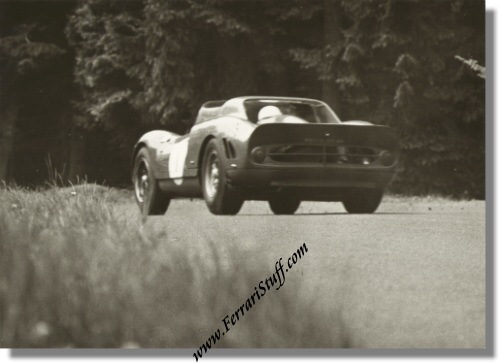 This is a vintage 1965 photo of the factory entered Ferrari 275 P2 of John Surtees and Ludovico Scarfiotti en route to victory in the 1965 running of the Nurburgring 1000 KM. The car in question is S/N 0828 which has lived a troubled life, having rebodied at least twice and virtually burnt to ashes when owned by famous French cartoonist Albert Uderzo in 1981, was rebuild over a period of 5 years and resides in the same Italian collection ever since. The photos is in mint condition, measures some 17.5 x 12.5 cm (7 x 5 inches) and carries the stamp of the photographer on the back.